For nearly forty years, New World Library cofounder Shakti Gawain has given millions of people clear and gentle guidance to create a new way of life — one in which we listen to our intuition and rely on it as a guiding force. We hope you’ll enjoy this excerpt from the 25th Anniversary Edition of her book Living in the Light, which explains how following our inner guidance can help us create a new life and a new world. Learning to trust your intuition is an art form, and like all other art forms, it takes practice to perfect. You don’t learn to do it overnight. You have to be willing to make “mistakes,” to try something and fail, then try something different the next time — and sometimes, perhaps, even embarrass yourself or feel foolish. Your intuition is always correct, but it takes time to learn to hear it correctly. If you are willing to risk acting on what you believe to be true, and risk making mistakes, you will learn very fast by paying attention to what works and what doesn’t. If you hold back out of fear of being wrong, learning to trust your intuition could take a lifetime. It can be hard to distinguish the voice of our intuition from the many other selves that speak to us, from within — the different parts of ourselves that have their own idea of what’s best for us. People frequently ask me how to differentiate the voice or energy of intuition from all the others. Unfortunately, there’s no simple, sure-fire way at first. Most of us are in touch with our intuition whether we know it or not, but we’re actually in the habit of doubting or contradicting it so automatically that we don’t even know it has spoken. The first step in learning is to pay more attention to what you feel inside, to the inner dialogue that goes on within you. For example, you might feel, “I’d like to give Jim a call.” Immediately, a rational, doubting voice inside says, “Why call him at this time of day? He probably won’t be home,” and you automatically ignore your original impulse to call. If you had called, you might have found him at home and discovered he had some important information for you. Another example: you might get a feeling in the middle of the day that says, “I’m tired, I’d like to take a rest.” You immediately think, “I can’t rest now, I have a lot of work to do.” So you drink some coffee to get yourself going and work the rest of the day. By the end of the day you feel tired, drained, and irritable, whereas if you had trusted your initial feeling, you might have rested for half an hour and continued about your tasks, refreshed and efficient, finishing your day in a state of balance. As you become aware of this subtle inner dialogue between your intuition and your other inner voices, it’s very important not to put yourself down or diminish this experience. Try to remain a somewhat objective observer. Notice what happens when you follow your intuitive feelings. The result is usually increased energy and power, and a sense of things flowing. Now notice what happens when you doubt, suppress, or act against your feelings. Usually, you will observe decreased energy; you may feel somewhat disempowered or depressed. You may even experience emotional or physical pain. Whether or not you act on your intuitive feelings, you’ll be learning something, so try not to condemn yourself when you don’t follow your intuition (thus adding insult to injury!). Remember, it takes time to learn new habits; the old ways are deeply ingrained. I’ve been working intensively on my own re-education for many years, and while the results I’m enjoying are wonderful, there are still times when I don’t yet have the courage or awareness to be able to trust myself completely and do exactly what I feel. I’m learning to be patient and compassionate with myself as I gain the courage to be true to myself. Suppose you are trying to decide whether to change jobs. You might have a conservative self that feels it would be safest to stay where you are, an adventurous self that is eager to do something different, a self that is concerned about what other people will think, and so on. One way to handle this is to “listen” to each of these voices and write down what each has to say (perhaps using a different-colored pen for each one). Then just let yourself sit with all the conflicting viewpoints for a while without trying to resolve them or make a decision. Eventually, you will start to get an intuitive sense of what your next step needs to be. As you get to know the different selves within you, you will discover that your intuitive self has an energy or a feeling that is different from the other voices. In time, you will learn to recognize it quite easily. One important step in learning to hear and follow your intuition is simply to practice “checking in” regularly. At least twice a day, and much more often, if possible (once an hour is great), take a moment or two (or longer, if you can) to relax and listen to your gut feelings. Cultivate this habit of talking to your intuitive self. Ask for help and guidance when you need it and practice listening for answers that may come in many forms: words, images, feelings, or even through being led to some external source such as a book, a friend, or a teacher who will tell you just what you need to know. Your body is a tremendous helper in learning to follow your inner voice. Whenever you feel your body is in pain or discomfort, it is usually an indication that you have ignored your feelings. Use it as a signal to tune in and ask what you need to be aware of. As you learn to live from your intuition, you give up making decisions with your head. You act moment by moment on what you feel and allow things to unfold as you go. In this way, you are led in the direction that is right for you, and decisions are made easily and naturally. If possible, try not to make big decisions concerning future events until you are clear about what you want. Focus on following the energy in the moment and you’ll find that it will all be handled in its own time and way. When you must make a decision related to something in the future, follow your gut feeling about it at the time the decision needs to be made. Remember, too, that although I sometimes speak of following your inner intuitive voice, most people do not literally experience it as a voice. Often it’s more like a simple feeling, an energy, a sense of “I want to do this” or “I don’t want to do that.” Don’t make it into a big deal, a mysterious mystical event, a voice from on high! It’s a simple, natural human experience that we have lost touch with and need to reclaim. Shakti Gawain is a pioneer in the field of personal growth and consciousness. Along with Marc Allen, Gawain cofounded New World Library in 1977. 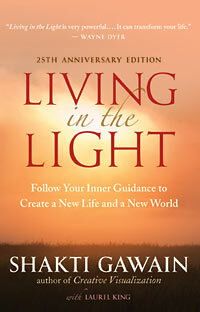 The updated and revised 25th Anniversary Edition of her bestselling book Living in the Light was published in 2011. Visit her online at ShaktiGawain.com. Excerpted from the book Living in the Light. Copyright © 1986, 2011 by Shakti Gawain and Laurel King.